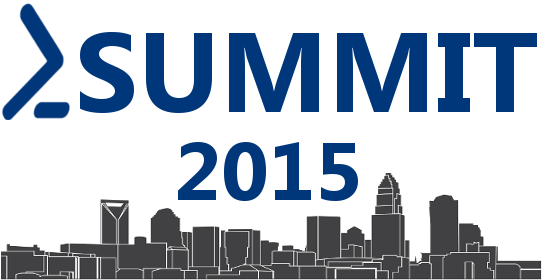 Come Speak at PowerShell Summit 2015! As you may know, my home town of Charlotte NC will play host to the PowerShell Summit 2015 NA next April. This event will supplant the Charlotte PowerShell Users Group regularly scheduled PowerShell Saturday event, and it is a rare opportunity that you will not want to miss! The summit is currently accepting submissions for talks, and I’d like to suggest that you do so. You do not need to be an expert, you do not need to be an experienced speaker - you simply need a shell story to tell, and I know you have one you’re dying to share. The benefits of speaking are many, including free attendance to the event. You'll get to rub elbows with members of the PowerShell team and interact with industry experts and community leaders from across the globe. So please, consider sharing your story by submitting a talk. The deadline for submissions (15 Sept) is approaching rapidly, and I would hate for you to miss out on this singular opportunity. DSC is like remoting – when it works it’s amazing. When it doesn’t work….. who knows why? While prepping a Desired State Configuration demo for SQL Saturday #328, I hit a small roadblock that proved to waste several hours of my time. I’m documenting it here in the hopes that it helps someone else. execute Start-DSCConfiguration command with -Force parameter. I finally swallowed my pride and reached out to DSC trailblazer Steve Murawski, who was able to quickly and generously point me to the fix. In my case, it would seem that the DSC local service was hard at work on my target node trying to make things work. The problem was that DSC neglected a failed installer (or the resource in question failed to report it correctly). In any case, this left DSC in a state where it thought a configurable something is happening, and thus it should prevent new things from happening. Specifically, I was trying to install SQL Server using xSqlPs, but the password I specified for sa did not meet the strong password requirements and the installation exited. For some reason I’m still investigating, the xSqlServerInstall resource failed to notice the error. The first step was the only one I hadn’t tried, because I didn’t know anything about that file. And it’s the key – that file tells DSC what needs to be done. If it isn’t there, DSC seems to think that everything is back to being cool. Here is some code I’ve started using to automate the fix described above.